Duchenne muscular dystrophy (DMD) is an X-linked recessive disorder caused by a lack of dystrophin, and has an overall incidence of 1 in 4700 male births. 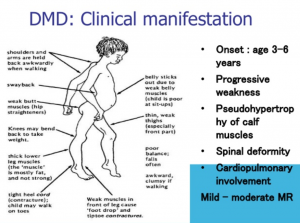 The progressive character of the disease is due to muscle wasting and its replacement by connective tissue. Muscular dystrophy is characterized by progressive muscular weakness, from childhood, which eventually results in the loss of gait performance when patients are approximately 10–12-years-old. These changes lead to weakness, which will first affect the proximal muscle groups and the distal ones on a later stage, all of those compromising the child's posture and gait. It is very important that the physiotherapist keep an eye on the dynamic quantitative assessment of gait in patients with Duchenne Muscular Dystrophy as this would help in evaluating the progression of the disease and to adapt any appropriate therapy. Diagnosis typically begins in early childhood after suggestive signs and symptoms are noticed, such as weakness, clumsiness, a Gowers’ sign, difficulty with stair climbing, or toe walking. Prompt referral to a neuromuscular specialist, with input from a geneticist or genetic counselor, can avoid diagnostic delay. The Bayley-III scale of infant development and Griffiths Mental Development Scales measure the rate of development in children, and both have the ability to highlight early developmental delays in children with DMD. The NSAA, with revision, can be used to test children as young as 3 years. Hip kinematics during gait are clinically meaningful outcome measures at 4–8 years.Other measures assessing antigravity function, considered exploratory in DMD, include the Alberta Infant Motor Scale, Hammersmith Functional Motor Scale Expanded, and the Gross Motor Function Measure. Many studies are showing evidence of proximal weakness affecting the muscle groups first and then followed by distal weakness. As this is true for both upper and lower limb muscles we are going to focus on the lower limbs only and the characterization of the Duchenne Gait. The first evident compensations are due to gluteus maximus weakness and tightness in the hip flexors.. The consequence of this is development of lumbar lordosis, an excessive anterior pelvic tilt and a 'double bump' sagittal pelvic tilt.D'Angelo, M. G., et al. (2009). "Gait pattern in Duchenne muscular dystrophy." Gait Posture 29(1): 36-41</ref> Muscle wasting in the quadriceps is affecting the knee movement in loading response, when patients trying to avoid flexion of the knee. Furthermore, the knee hyperextension later in stance might be due to an attempt to keep the body stable while compensating for the weak quadriceps. D'Angelo et al., demonstrated this in their study by showing absence of extensor knee movement in patients with DMD. Looking at the distal parts of the lower limb, it has been found that there is an excessive foot plantarflexion during swing phase and this was due to compensatory movement in the flexors and abductors of the hip, in order to aid floor clearance. However, velocity and cadence in this population group is similar to those in healthy subjects but stride length is known to be reduced and step width increased.D'Angelo, M. G., et al. (2009). "Gait pattern in Duchenne muscular dystrophy." Gait Posture 29(1): 36-41</ref> It is expected the gait pattern to get more severely affected once the children start developing ankle tightness and contractures of the hips. Prevention of contracture and deformity requires daily passive stretching of joints, muscles, and soft tissues at risk of tightness; support of movement by decreasing the effects of gravity and optimizing biomechanics to allow more active movement; manual therapy techniques and prolonged elongation of soft tissues; and optimal positioning, including individualized use of splinting, orthotic interventions, standing devices, serial casting, and custom seating and power positioning components in mobility devices. ↑ Archibald KC, Vignos PJ., Jr A study of contractures in muscular dystrophy. Arch Phys Med Rehab. 1959; 40:150–157. ↑ Dooley J, Gordon KE, Dodds L, MacSween J. Duchenne muscular dystrophy: a 30-year population-based incidence study. Clin Pediatr (Phila) 2010; 49:177–179. ↑ Liang, W. C., et al. (2018). "The natural history of the patients with Duchenne muscular dystrophy in Taiwan: A medical center experience." Pediatr Neonatol 59(2): 176-183. ↑ Hsu JD, Furumasu J. Gait and posture changes in the Duchenne muscular dystrophy child. Clin Orthop Relat Res 1993; 288(March):122–5. ↑ McDonald CM, Henricson EK, Abresch RT, et al. The 6-minute walk test and other endpoints in Duchenne muscular dystrophy: longitudinal natural history observations over 48 weeks from a multicenter study. Muscle Nerve. 2013; 48:343–56. ↑ Connolly AM, Florence JM, Cradock MM, et al. One year outcome of boys with Duchenne muscular dystrophy using the Bayley-III scales of infant and toddler development. Pediatr Neurol. 2014; 50:557–63. ↑ Mercuri E, Coratti G, Messina S, et al. Revised North Star Ambulatory Assessment for young boys with Duchenne muscular dystrophy. PLoS One. 2016; 11:e0160195. ↑ Heberer K, Fowler E, Staudt L, et al. Hip kinetics during gait are clinically meaningful outcomes in young boys with Duchenne muscular dystrophy. Gait Posture. 2016; 48:159–64. ↑ Piper MC, Darrah J. Motor assessment of the developing infant. Saunders; 1994. ↑ Bushby K, Finkel R, Birnkrant DJ, et al. for the DMD Care Considerations Working Group Diagnosis and management of Duchenne muscular dystrophy, part 2: implementation of multidisciplinary care. Lancet Neurol. 2010; 9:177–89. ↑ .Bettina Westhoff, Andrea Petermann, Mark A. Hirsch, Reinhart Willers, Rudiger Krauspe. Computerized gait analysis in Legg Calve Perthes disease - Analysis of the frontal plane. Gait & Posture October 2006; 24 (2):196-202. ↑ Andrews, J. G. and R. A. Wahl (2018). "Duchenne and Becker muscular dystrophy in adolescents: current perspectives." Adolesc Health Med Ther 9: 53-63. ↑ Maricelli, J. W., et al. (2016). "Trendelenburg-Like Gait, Instability and Altered Step Patterns in a Mouse Model for Limb Girdle Muscular Dystrophy 2i." PLoS One 11(9): e0161984.